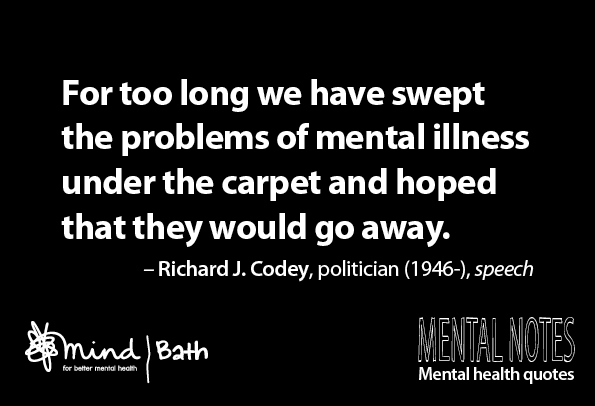 Image | This entry was posted in Quotes and tagged Bath Mind, Kate McDonnell, mental health, Mental Notes, quote, The Bipolar codex. Bookmark the permalink. A great quote from Mental Notes. Please add any comments to the author’s page as this is not one of my original posts. What a bold, powerful quote. We definitely need to change the way we look at mental illness in this country. We’ve made some progress in lifting the veil on mental illness, but we still have a long way to go as far as changing people’s attitudes toward the mentally ill. Thanks for this.